Splash Damage is taking its shooter free-to-play. 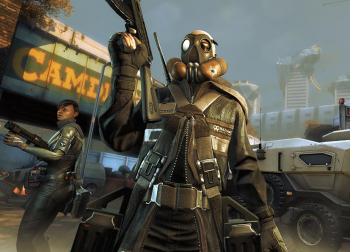 You may recall the teaser video for Dirty Bomb which blew up last November, swiftly followed with gameplay footage and other fun things. Time has passed since then, and Dirty Bomb has had a name change, but Splash Damage's Extraction is ready for closed Beta. It's a free to play shooter now, but Splash Damage promises no kill is cheap, no win is paid for. "Whether you're in a world-class competition or a quick firefight, it's your skill that brings the kill," says Splash Damage. It's still a London based shooter, which should be fun for anyone who's been to London; Splash Damage is a local firm, and knows the Smoke well. Though the name may have changed, gameplay hasn't. You pick your style of play; maybe you want to snipe, or run and gun, or perhaps you're the healing hands that will keep the team alive. "Master your merc, serve your team," says Splash Damage, as you work your way through the mission objectives, or just shoot anything that moves and most things that don't, in a stand-up firefight. If you're wondering why the game changed its name, Splash Damage says it wasn't sure it could get a worldwide trademark for that title. But that's the only thing that's changed, the developer promises. No official release date yet, but if the team's taking this to closed beta, a release can't be that far behind. If you're interested in signing up for the closed Beta, have a look over here.